Watch Dunya TV Mazaq Raat Latest Episode 31 December 2014. 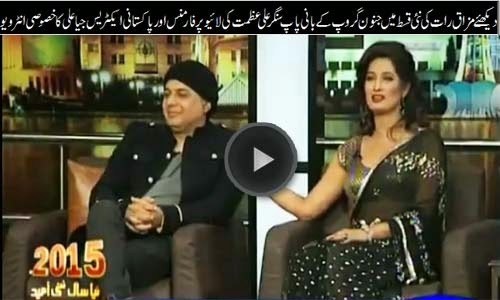 Famous pop singer Ali Azmat and a cute Pakistani actress Jia Ali are the chief guest of this latest episode. Mazaaq Raat is a infotainment program broadcast by Dunya TV Pakistan which is widely watched in local and international community of Pakistani's. In each episode of Mazaaq Raat a new guest join the mazaaq Raat which may be a celebrity, Politician, sports man or a common man. Watch Mazaaq Raat with Noman Ejaz, Amanullah, Sakhawat Naz, DJ Mohsin Abbas Haider, Iftikhar Thakur Fatima Sohail, Hanel Siddiqi, Samiah khan (Astrologer) and cute laughing audience. Mazaaq Raat airs on Monday, Tuesday & Wednesday at 11:03 PM only on Dunya News.